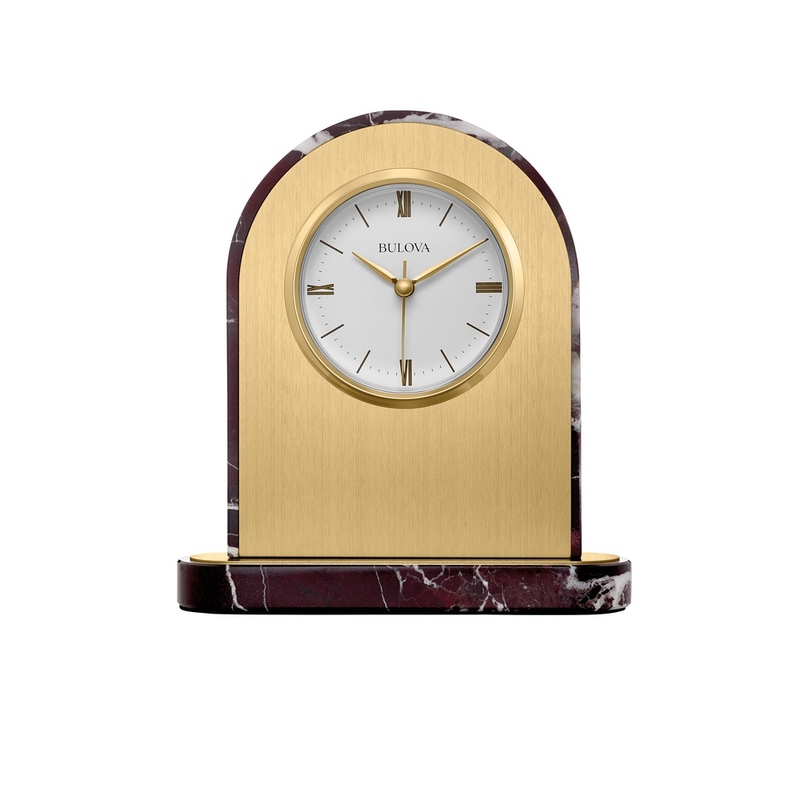 Classic lines and traditional style make the Desire Engravable Table Clock a distinctive gift. It features a base hewn from imported Turkish red marble with white vein highlights, a beautiful brushed brass finished face plate and contemporary dial with Roman numerals and hour markers behind a shatter resistant lens. The entire face plate is removable for engraving. 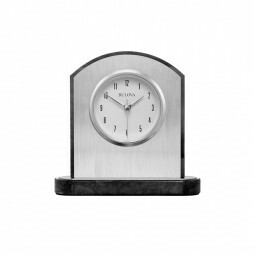 The Mirage Engravable Table Clock is the perfect gift! Its' elegant design includes polished black marble with white accent vein lines on the base, a brushed silver face plate, and a transitional dial with Arabic numerals protected by a shatter resistant lens. The entire face plate is removable for engraving or printing for commemoration of a special event. Howard Miller Templeton Table Clock is a chic clock that will keep your home well decorated and in tune with the rest of the decor. This contemporary dark satin Rosewood finished carriage clock with curved front and silver accents features a glass crystal that reveals the intricate, polished silver finished skeleton movement. Brushed silver horizontal bands are used at the top and bottom to accent the front of the case. Clear front and rear panels offer a clear view of the clock components from both front and back. This classy Howard Miller Prestige Glass Crystal Table Clock is sure to bring a sense of style and exquisiteness to your dcor. 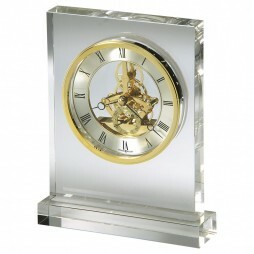 Rectangular glass crystal tabletop clock, made with heavy 1-1/4″ thick, non-lead glass base and case that reveals a polished brass finished skeleton movement. The dial includes a circular, diamond-cut, brass-finished numeral ring with black Roman numerals. It also features a polished brass-finished bezel that surrounds the dial and separate seconds track with Arabic numerals. 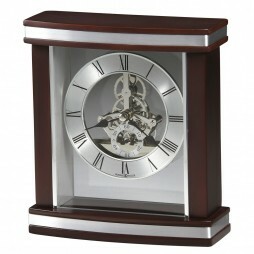 The clock will also look great in the living room in addition to being a great piece of dcor. Classic and attractive, this Howard Miller Baxter Tambour-Style Table Clock is an ideal pick for your walls. This uniquely-designed wall clock is made from superior-quality material that adds to its durability. 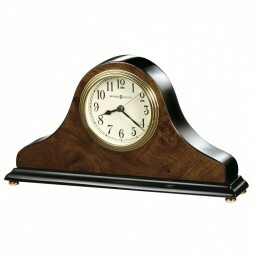 It is an attractive high-gloss walnut piano finish on a hardwood tambour style table clock featuring a wood burl pattern on the front and back, with polished black sides and base. Because of the smaller profile, this clock can easily double as a table clock or a mantel clock where space is at a premium. Polished brass button protective feet raise the clock from its surface. Adding this alluring table clock is the great way to adorn your home. It is an ideal gifting option too. 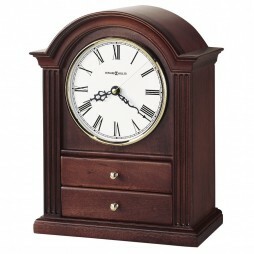 If you’re looking for a trendy clock, then your search ends at this Howard Miller Kayla Mantel Clock with Jewelry Drawers. 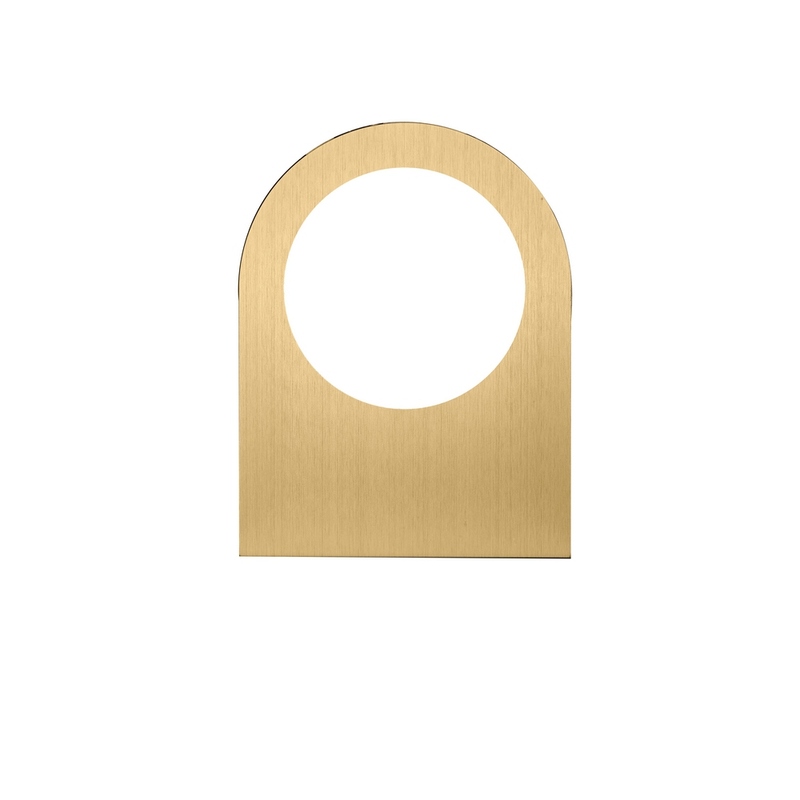 Fluted columns and a polished brass tone bezel create a classic appeal. The addition of two felt-lined jewelry drawers make this arch top clock a thoughtful and unique choice. Beneath the convex glass crystal lays an off-white dial with black Roman numerals and black serpentine hands. Finished in Windsor Cherry on select hardwoods and veneers with Quartz movement.